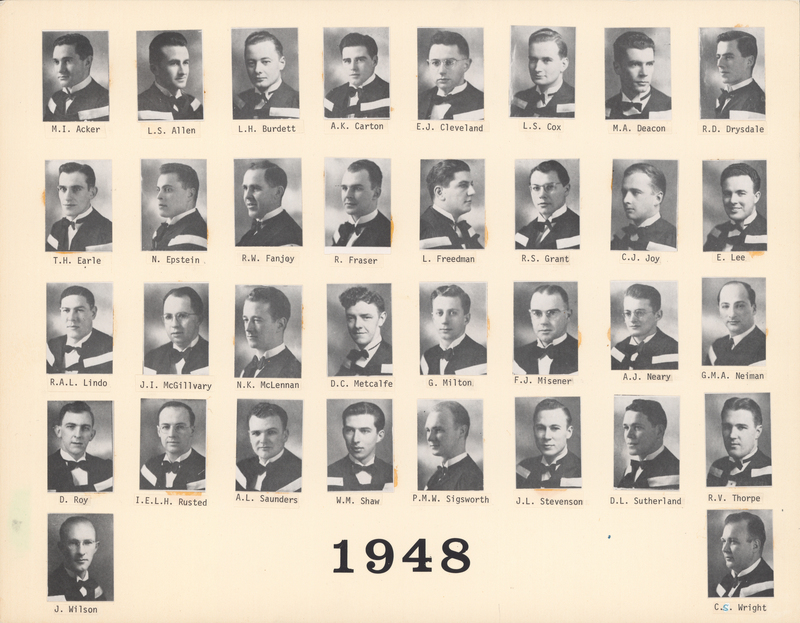 File is a composite photograph the Dalhousie Faculty of Medicine Class of 1948. 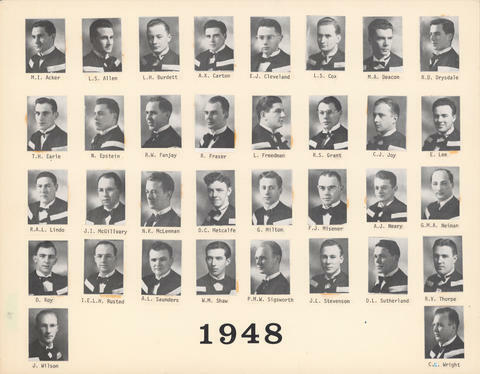 Photograph includes 32 photocopies of individual student portraits. Composite photograph includes portraits: M.I. Acker, L.S. Allen, L.H. Burdett, A.K. Carton, E.J. Cleveland, L.S. Cox, M.A. Deacon, R.D. Drysdale, T.H. Earle, N. Epstein, R.W. Fanjoy, R. Fraser, L. Freedman, R.S. Grant, C.J. Joy, E. Lee, R.A.L. Lindo, J.I. McGillvary, N.K. McLennan, D.C. Metcalfe, G. Milton, F.J. Misener, A.J. Neary, G.M.A. Neiman, D. Roy, I.E.L.H. Rusted, A.L. Saunders, W.M. Shaw, P.M.W. Sigsworth, J.L. Stevenson, D.L. Sutherland, R.V. Thorpe, J. Wilson, C.J. Wright.